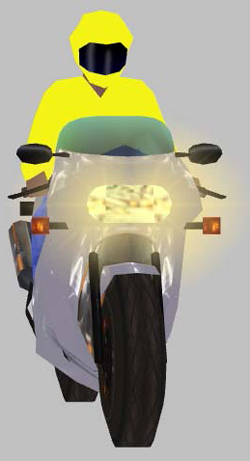 The objective of this project was to determine the effect of headlight configuration (daytime running lights, high beam, modulating) and rider color (bright yellow, blue denim, and black torso and helmet) on the conspicuity of a motorcycle to a driver of a passenger vehicle in a simulated environment. To achieve this, 36 participants completed three drives on a National Advanced Driving Simulator (NADS) 2 driving simulator. During two of the drives, participants were presented with six oncoming motorcycles and three leading parked motorcycles, each with a different combination of rider color and headlight configuration. Each of the nine motorcycles was present in either the urban or rural driving environment. Participants indicated when each motorcycle was first visible to them by pressing a button on the steering wheel of the driving simulator. The detection distances from the motorcycles to the participant vehicles were then recorded. Participants were within one of two groups: younger drivers (25 to 55) or older drivers (65 and older). This research applied repeated measures analysis of variance to investigate the impact of headlight configurations and rider color on motorcycle conspicuity in urban and rural environments. The researchers found that oncoming motorcycles with modulating headlights were detected at the greatest distance compared to motorcycles with high beam or daytime running lights. Participant ability to detect an oncoming motorcycle was also significantly influenced by the combination of headlight configurations with black or bright yellow rider colors. Leading motorcycles in urban environments were detected at a greater distance compared to those in rural environments. Leading motorcycles with riders having bright yellow clothing and helmet were detected at the greatest distance, followed by motorcycles with riders having blue denim and black rider colors. A significant interaction effect among the driving environment, rider color, and age group was also found for the detection distance of leading motorcycles.